moe. at the Ogden Theatre in Denver..
moe. played two good shows at the Ogden Theatre in Denver on 11-30 and 12-01, 2012. I was the first taper into the venue both nights. I was able to set-up dead center, in the same spot, just in front of the soundboard both nights. I'm very happy with the recordings I made. Night one was better played, but I liked the second show better. Mostly because of the song selection on night two. Just this week, I took delivery of the first pair of Naiant AKG Active cables made. So, this was a great opportunity for me to test them. I used the actives both nights and I made comparison recordings versus full bodied AKG C-481 microphones on the second night. Sources are noted below in italics. Steve Hackett's new album Genesis Revisited II was released yesterday. 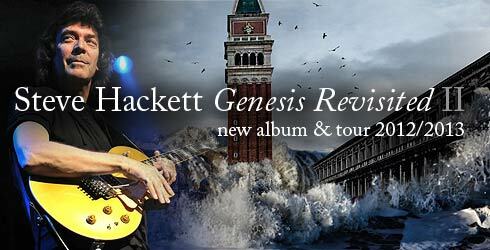 The web site: http://ultimateclassicrock.com/steve-hackett-genesis-revisited-ii-album-premiere/ is offering a free streaming preview. You can hear all the songs on the album in their entirety by following this link! Who knows how long that free offer will be available, so check it out soon! I've done some listening and it sounds very, very good. "Supper's Ready" with Phil Collin's son Simon Collins on vocals is my favorite track so far. The web site says Hackett will be touring to support the new album. I hope he comes to the US. I'd love to see him play that old Genesis material live. The band Furthur led by Bob Weir and Phil Lesh from the Grateful Dead played three consecutive nights at Red Rocks Amphitheatre this year. I saw the Saturday, September 22nd show. When the music started, the sound from the PA system was crisp, clear and very punchy in the tapers section. The first song, a cover of George Harrison's delicately beautiful "Here Comes the Sun" from The Beatles Abbey Road album, was played well and caught me a bit off guard. The band is constantly experimenting with song placement so, it wasn't a huge surprise to hear "Sugar Magnolia/ Sunshine Daydream" close the first set. I thought it worked very well as the first set closer. Hearing the first notes of "Playing In the Band" at the start of set two brought a smile to everyone's face. The band left "Playing In the Band" unfinished and then easily segued into "No More Do I" then into the "China Cat Sunflower" > "I Know You Rider" pairing. The line in "I Know You Rider," "I'll shine my light through the cool Colorado rain." brought the expected cheer from the eager Colorado audience. The first real highlight of the show for me was hearing the interesting jam during "St. Stephen" that teased "The Eleven" before going back to "St. Stephen." I also enjoyed hearing the second verse of "Dark Star" played much faster than I had ever heard it played. Somehow, I think it worked very well. A great rendition of "Fire on the Mountain" came after the second verse of "Dark Star" and closed the second set. The "Morning Dew" > "Playing In the Band (reprise)" encore was simply a beautiful way to end the night. On September 13, with the summer heat finally starting to fade, I drove up to the Fillmore in Denver for my first show at that venue in a little more than two years. Gov't Mule and Anders Osborne were on the bill. I thought the Anders Osborne opening set was tedious. The sound was not good and the songs just ran on and on for me. 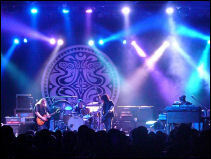 When Gov't Mule took the stage, the sound instantly got better. The nicely balanced, but punchy sound was a welcome relief after the muddy and overly loud opening act. Gov't Mule songs on the first set included the classics, "Bad Little Doggie" and "Lay Your Burden Down" and a new song, "Captured." The second set had a dream set list including, "Rocking Horse", Thorazine Shuffle", The Creedence Clearwater Revival epic, "Effigy", "Fallen Down", and "Blind Man In the Dark." Overall, it was a great night of music. Stargazers Theatre hosted the Second Annual Indy Music Awards on September 6, 2012. The bands were chosen by a yearly Best Of... readers music poll run by the newspaper. There were three stages; one inside and two outside, with the bands playing 30 to 40 minutes sets each. The event was free to the public. 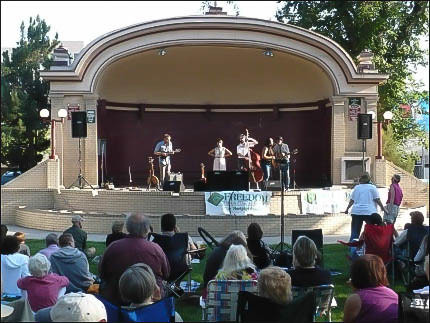 I saw The Grant Sabin Band (second place Blues category) play first on the KRCC (outside) stage. I'd never seen him before and I enjoyed his mostly original all blues set. I also saw Malakai (best Metal - Hard Rock), Tony Exum, Jr. (best Jazz - solo), Claymore Disco (People's Choice), The Flumps (third place Indy Rock) and the Haunted Windchimes (best Americana Band & best Album). I really enjoyed the Flumps short set. But, the highlight for me was The Haunted Windchimes who closed the night. The Haunted Windchimes set was delayed more than an hour, so they were anxious to play. Windchimes leader Inaiah Lujan told the audience the band was coming down off the stage to play acoustically in front of the stage rather than wait for the lengthy sound check. It was a very unusual thing to do, but I thought it added an interesting twist to the night of music. It was a little hard to hear the band with no amplification. So, the sound crew put up two microphones in front of the band and amplified those microphones through the PA system. Due to the low sound volume, the audience was very quiet and attentive, which was a really nice bonus. The Haunted Windchimes played a short but sweet set including their songs, "Out With the Crow", "St. Clair Sound," "Pine Six String" and the show closer "Little Box." I'm not completely happy with any of the recordings I made, so I just uploaded some of the pictures I took. 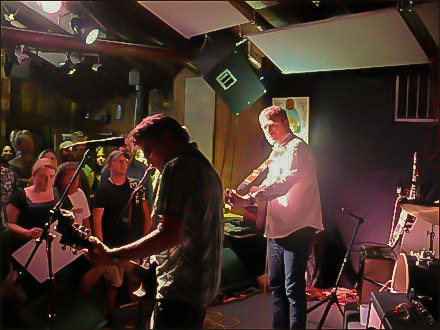 David Lowery and Johnny Hickman played a Cracker (acoustic duo) set at The Silver Tongue Devil Saloon in Green Mountain Falls on September 2, 2012. The venue is what used to be the Pine Gables Tavern. I was very impressed with Ashley Raines and the New West Review who played their set between the Whistle Pigs and Cracker. Ashley Raines voice and the way the band played reminded me a lot of Keb' Mo'. The Cracker set was marred by on-stage monitor and PA problems. Lowery wasn't very happy or talkative. But, Johnny Hickman sang more songs than he usually does. It was nice to hear more Hickman songs than usual. I recorded all three of the bands, but I'm not really happy with any of the recordings. Setting up my microphones next to the SBD, which was located on the far left of the stage, was not the best idea. From that position I could really only hear the left PA speaker. I wanted the SBD feed for the Cracker set, so, I set my cardioid microphones to X/Y as I do for PA stack recording and hoped to make the best of the situation. As it turned out, unbelievably, the left side of the PA system was out throughout the whole Cracker set! Since my microphones were positioned on the far left I had to rely heavily on the SBD feed to fill in the sound of the Cracker recording. The microphone recordings are very, very distant sounding. Unfortunately, the SBD feed was very heavy on Lowery's guitar and lacking in Hickman's vocal and guitar. That recording it is not very unbalanced. I have made The Haunted Windchimes ~ 2012-08-04 recording available for individual MP3 download and streaming on the Recordings page. Give it a listen. I think it turned out well. 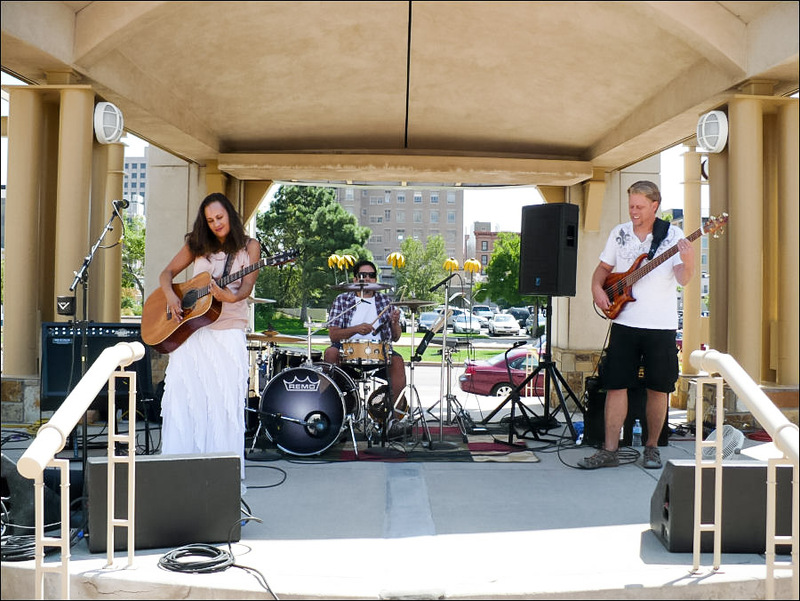 The Wendy Woo Trio played another excellent show at the Hilton Antlers Hotel Plaza in downtown Colorado Springs on Friday afternoon. There wasn't a big audience this year, but that didn't stop the band from playing well. I used the Audix Micro Series omni-directional capsules again, and I was rewarded with another very good recording. In the past when I tried using omni's to record this annual event I got a muddy and very reverberant recording. When I got a chance to listen back to this year's recording, I was pleasantly surprised not to hear a lot of slap back from the buildings, stone and concrete surrounding the stage. The Haunted Windchimes free Saturday concert on August 4, 2012 in Acacia Park, was very good. We got there early enough to see the band finishing up the sound check. I set-up to record really close to the stage and was perfectly centered. I used a pair of spaced Audix Micro Series omni-directional capsules I recently bought to record the show. I think the recording came out very nice. The sound was excellent and the crowd was very respectful of the music. There wasn't the typical loud audience chatter you hear at rock shows at this performance. That, plus perfect weather, a great band and setting up close to the stage made for an excellent recording with good clarity and plenty of bass. I found a good spot to set-up and record The Samples. It was up front and centered. It was good that I got there early, because it got crowded quickly. The Samples did a short but well played set. I didn't get a soundboard feed because the bass player was multi-track recording the performance. It was sunny and hot but not windy yet. My recording sounds OK, but not great. After The Samples set I went over to the Arapahoe 2 Stage to see Alicia Witt perform. I got there just after she got started, so I didn't bother recording. Her music was just OK. She can sing and play keyboards well. The songs weren't bad, but just not very exciting for me. Denver band Strange Americans played next. They were being filmed for an Altitude TV show that will air on July 3. I liked The Strange Americans much better than Alicia Witt. Unfortunately I didn't record The Railbenders or Roger Clyne & the Peacemakers as I had planned. I did a slight re-design today. I split the Blog pages up and added a Reviews page. I think that'll make more sense eventually. I added the Quick links side bar to the Blog page. I'm not sure if that's a keeper or not. timebetweenthenotes.com is up and running online. I still have a lot of work to do. I promise to get more content up. I'm happy to have an official presence on the World Wide Web. I'm finding it to be more time consuming than I anticipated to put the reviews and projects up. But, I hope it'll be worth it in the end! May Day. It's May already! We didn't even have winter in Colorado Springs this year. I've contacted a fellow taper who has his own design and web business about hosting the site. He's going to help me get that done. I hope to go live with the whole site sometime this week or next. I really wish there was a local show to tape this weekend. I only recorded one show in April. Wooo Whooo! I registered the domain name today. :) Everything is set to go except for minor editing and making sure all the links go somewhere. I decided to do a photos page called Images. I'll also include some artwork and eventually concert posters. My site is quickly coming together. I hope to have everything ready for going live in May. 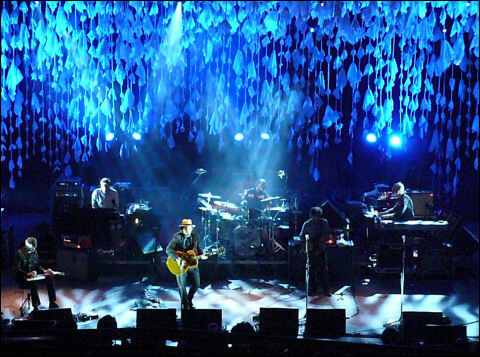 I have tickets for Wilco and Furthur. I'm still debating whether to do a photos page. I'm leaning yes. The next big taping opportunity for me is The Denver Day of Rock on Memorial Day Weekend in Denver. There are several bands playing on multiple stages at the free concert in downtown Denver. The Samples, The Railbenders, Roger Clyne & the Peacemakers and Toad the Wet Sprocket are bands I plan to see and record. Recording the last two bands I mentioned will pose a dilemma for me, because they are both playing at the same time on different stages!